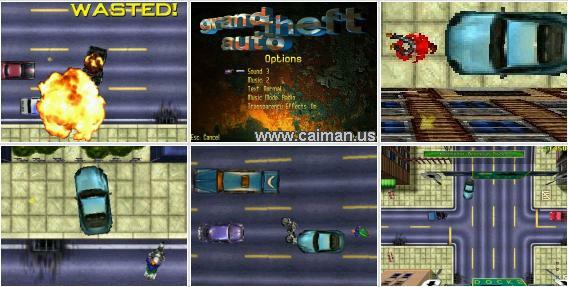 Caiman free games: Grand Theft Auto by Rockstar. In this formerly commercial game called, Grand Theft Auto: "Your life and crime begins on foot in Liberty City, in an area called South Park. For your convience, a clean car is provided. Carry out jobs for The Mob to speed your rise from lowly junior joyrider to a member of the largest, most powerful family in the city." This is one of the first, craziest types of games that you can imagine. 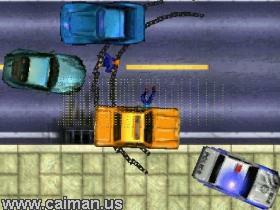 The things in real life which are illegal, you get points for in this game! Points awarded for: Shunts 'n' Bumps, Hit 'n' Run, Hijacking, Firearms Offences, Murder One amd Bank Jobs. If you are driving on the sidewalk and there is a pedestrian in your way, just rum him over. You'll get points for it. If walking to your destination is to slow, then just hi-jack a car. You get points for that also. This game has lots of options: Select from 1 of 8 different characters, support for 4 languages, music/sound options and screen resolution settings. Keys are also custmizable. There are several different levels/scenarios. The language in this game can be very offensive to some, but it greatly enhances the atmosphere of the game. Fill out the form, then click on submit, which takes you to another page entitled "LIMITED SOFTWARE LICENSE AGREEMENT." Read the form and click on submit. The download then starts. NOTE: The download URL will NOT be sent to you via email. 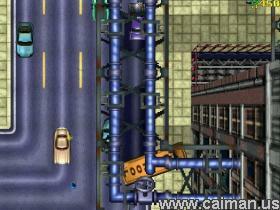 If running over pedestrians or foul language offends you, then this is not a game for you.